I think it’s great you’re cooking now, and I think it’s even better you’re posting the recipes. Thanks for a great blog! 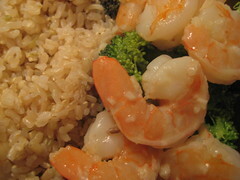 Mmm, this shrimp dish looks great! I’m sure you’re actually a fabulous cook. Every now and then it’s good to get away from cake for dinner and eat real food 🙂 (or at least, that’s what I tell myself)…Shrimp are such a versatile, wonderful ingredient! Hey I love change…change is good. And this shrimp looks just that. How funny you should post this … I just finished creating a blog post about garlic butter shrimp pasta! Of course, your’s is FAR healthier than mine … but your’s look just as tasty! Nom, nom!